It's the last weekend of Bigg Boss 11 before the finale. And time for Weekend Ka Vaar! Tonight, Salman Khan will meet the six remaining contestants - Hina Khan, Vikas Gupta, Shilpa Shinde, Akash Dadlani, Puneesh Sharma, Luv Tyagi - to review the past week. But that's not the only interaction that will bring masti and magic on screen tonight. We will also get to know what happened when the housemates met Rani Mukerji, Sidharth Malhotra and Manoj Bajpayee! Yes, the three Bollywood stars interacted with the Bigg Boss 11 housemates by asking them fun questions and playing games with them. One of the games involved each contestant pretending to be someone else. Vikas has to pretend to be Akash and he has too much fun imitating his accent and his dance steps. Shilpa pretends to be Hina and pokes fun at how the Yeh Rishta Kya Kehlata Hai star considers herself to be perfect in every way. The fun doesn't end there. 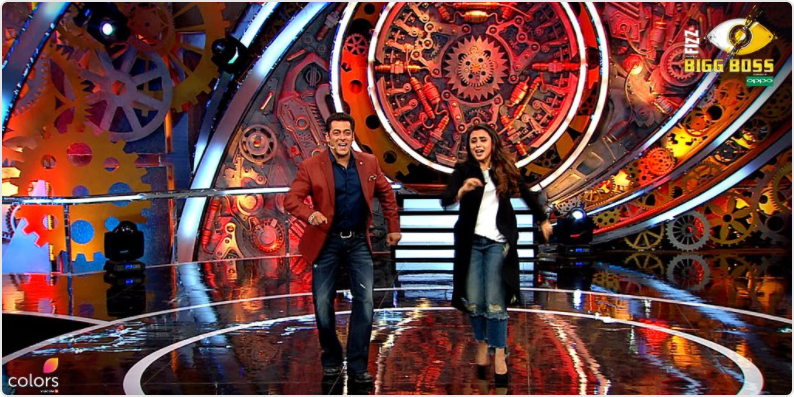 Rani and host Salman also take a trip down memory lane. The two good friends have starred in several movies together, including Chori Chori Chupke Chupke and Har Dil Jo Pyar Karega. When they share the stage tonight, they'll share some lovely anecdotes including about the time when Rani and Sallu would go on rides together after he bought them cycles during a shoot in Switzerland. They brought the cycles back to Mumbai after the shoot wrapped up. 10:03 pm: Hina Khan faces the questions next. She agrees that Vikas is the least deserving and is tasting his own medicine in the show now. She also says Shilpa is the most unhygienic contestant and Shilpa was a hindrance for her in the ‘Ticket To Finale’ task. 9:50 pm: Salman now gives the contestants a task where the contestants have to listen to the things they said about their fellow contestants and accept it if they have said it or not. The first one to perform the task is Shilpa. Shilpa is asked if she thinks Vikas is an attention seeker and she says yes. Next, she says Vikas should stay away from Puneeesh as he might use him for his own good and last she agrees Hina never accepts her mistakes. 9:46 pm: Salman re-enters the house. He takes the name of the nominated contestants and builds up the tension around who will be evicted from the house. But he also says that the name of the evicted contestant will be announced in Sunday’s episode. 9:45 pm: Rani takes a leave from Salman Khan and asks the audience to watch Hichki. 9:44 pm: Rani now plays a fun memory game with Salman. He has to add words and Rani will add two more words to it. The two actors make the game interesting by adding funny words to the sentence. Rani says Salman is a great guy, and is the best host of Bigg Boss. She says he has been a good friend to her from her initial days in the industry. She can't wait for Salman to have children, who are mashallah as good-looking as him. Salman praises Rani's talent, says she is a great dancer who never forgets a step once she has learnt it. The two then dance to Chandi ke daal par and Hata saawan ki ghata. He then points out the difference in today's order and the one they arrived at last week. Akash claims he is the best entertainer, that even the guests say so. Salman tells him, that it is very doubtful if any of the guests will recognise him outside the house. He asks Vikas if the popularity task was done with honesty. Vikas explains that it was not completed with honesty. He says once the girls said that they will take whichever spot, it didn't matter. The exercise became futile after that. Shilpa says it became a celebrity vs commoner issue. Vikas says it was the celebs' mistake because they did not fight for No.1 spot or put their points forward, the way Akash and Puneesh fought for it. Salman says the four had accepted defeat. Vikas says it was accepting defeat in the discussion, not in the show. But Salman says that is not how the audience sees it. Salman summarises that the contestants just accepted the standing in order to avoid an argument. He says they have made it to the finals. And he tells Akash that the fact that he has managed to reach the finals even though no one in the house likes him is an achievement. He tells him not to repeat his behaviour in the outside world as he will definitely get beaten up. Akash assures him what he is doing is only for the show. 9:20 pm: As Rani leaves, Vikas and Hina discuss how Shilpa Shinde thinks girls are meant to not study too much and achieve more than men. 9:19 pm: Rani finds Vikas Gupta’s act as Akash the most entertaining one. She appreciates them for their acting skills. Now, Rani asks contestants whose journey in the house gave them ‘Hichki’ in the house. Akash takes Shilpa’s name. Shilpa, in turn, takes Akash’s name. Rani Mukerji now leaves the housemates and wishes them luck for the finale of the show. 9:15 pm: As Rani says that it is difficult to be perfect for anyone, Shilpa pokes fun at Hina’s habit of refusing to do anything wrong in front of Salman Khan. Vikas Gupta comes up and makes fun of Akash and Akash comes wearing a wig and fails to entertain Rani. Last is Luv who plays Puneesh. Luv imitates the lover boy of Bigg boss and talks about Puneesh being the most known commoner of Bigg Boss 11. 9:07 pm: Salman shows the footage where the housemates stepped into each other’s character and had fun in the house. Akash plays Vikas, Shilpa is Hina, Vikas is Akash, Puneesh is Luv and Hina is Shilpa. Luv makes fun of Puneesh for losing his cool and Shilpa cries like Hina. The audience burst out laughing seeing this role reversal. 9:05 pm: Salman Khan enters the stage and greets the viewers in his peculiar way. He says that this is the last Weekend Ka Vaar episode and next week the audience will witness the finale of the show with Puneesh and Akash in it already. He shows the footage of live voting that happened in Friday’s episode.